Today, everyone is storing information in a USB key, a hard drive or a cloud (e.g. Dropbox). For our generation, it is quite normal to have a 1-GB stick, which can be taken anywhere with us. However, it was not the case for past generations. For example, from 1956 until today, the storage of data and its cost have considerably evolved. The first image below from the left shows how inconvenient it was to store data in a 5MB hard drive, which basically was the size of a small room. In 1956, a company1 had to pay $2,500 (of those days’ dollars) in order to rent (not buy!) such a big box for 1 month. In contrast, in 1980, the situation improved a little bit. You could buy a 10MB hard drive for $3,495; still very expensive for the size of one photo nowadays. And finally, in 2017, you could buy a 256GB SSD card which could fit on your finger for only $150. By looking only at the storage capacity, you can notice that it roughly doubled from 1956 to 1980, and then increased 25,600 times from 1980 to 2017. Needless to say, it is not a linear trend,but rather an exponential growth. In another graph, by looking at the USD cost per GB, there is an exponential decrease until 2018. 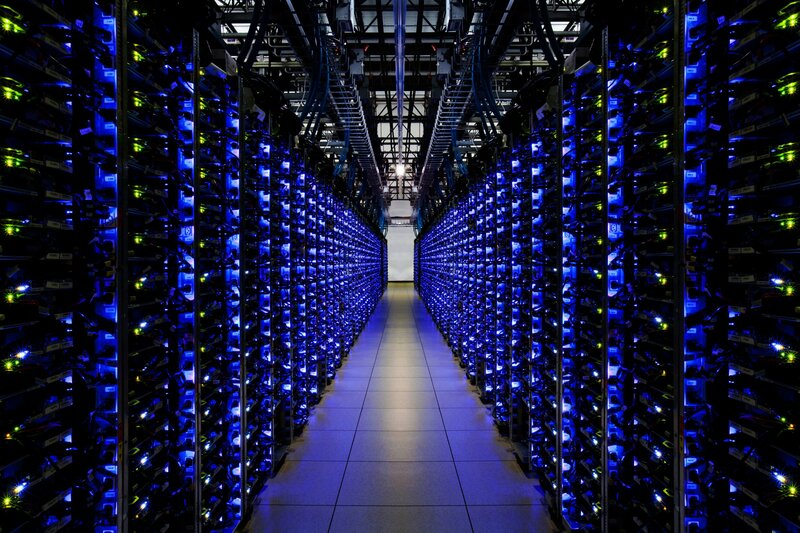 Today, storage costs tend to zero with free cloud storage (e.g. Dropbox, Google Drive) and that is going to continue. In the near future, that will go even further. In fact, scientists are looking at using DNA for storage2. It is quite expensive; it cost $7,000 to synthesize 2MB of data and then another $2,000 to read it. However, following such an exponential evolution, this is going to be mitigated very quickly. Going forward 10-20 years, everybody will be using DNA storage if we continue with the tendency. 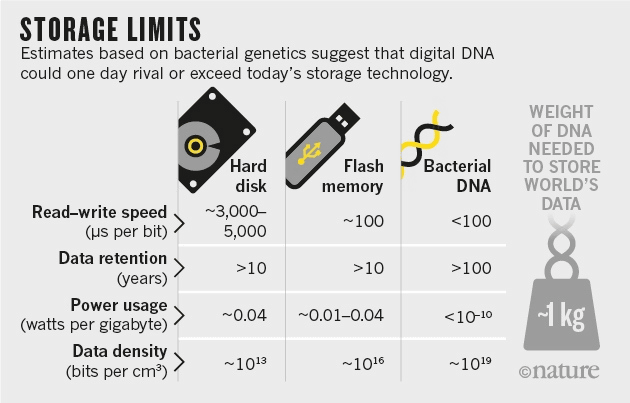 Basically, you can store 1 billion Terabytes in 1 gram of DNA storage; it means that you can store all of the world’s data in 1 kilogram of DNA. 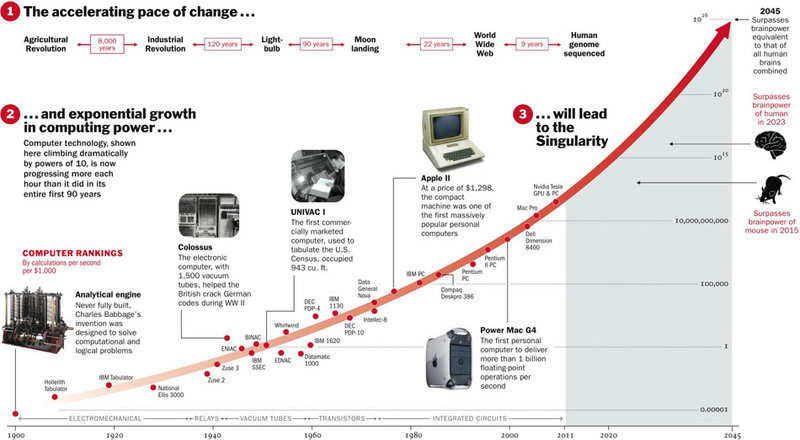 As the storage capacity took a huge jump, the computational power also caught an exponential growth. You can notice in the image below that we are entering the era of computers that are extremely powerful and can process things way faster that we could imagine. Typically, today we can buy a computer which thinks a fast as the brain of a rat for $1,000. Nowadays, we are finally at the stage where we have enough data and computational power to create very sophisticated models. Those models are inspired by the human brain neuronal network (i.e. Deep Learning3) and are widely used in the field of artificial intelligence. What if, in 2050, robots’ computational power was equivalent to that of all human brains combined?